Grantsville’s Trevor Tuckett (20) heads toward the goal during Friday’s non-region boys soccer game against Wendover in Grantsville. 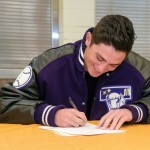 Tuckett had two assists in the Cowboys’ 8-0 win over the Wildcats. Grantsville seniors Ryan Tripp (8) and Dayne Linton celebrate after a goal during Friday’s non-region boys soccer game against Wendover. Tripp and Linton combined for three goals in the Cowboys’ 8-0 victory. 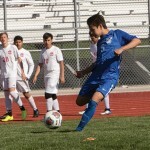 It has been a challenging season for the Grantsville boys soccer team, with injuries decimating an already-inexperienced lineup forced to play in the toughest region in Class 3A against powerhouses like Judge Memorial, Morgan, Summit Academy and South Summit. 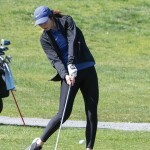 Thus, Friday’s 8-0 non-region victory over Tooele County foe Wendover was a welcome respite from some of those frustrations. The Cowboys (2-7, 0-3 Region 13) were up 7-0 at halftime against the visiting Wildcats (2-5, 2-3 Region 16), who had just 11 players available and were overmatched from the beginning by a stronger, bigger and deeper Grantsville squad. It didn’t take long for the Cowboys to exert their will against Wendover, a Class 1A school that plays soccer in Class 2A. Grantsville had a goal by freshman Trevor Tuckett disallowed because of an offside call mere seconds into the match. The Cowboys kept the pressure on the Wildcats, and senior Ryan Tripp converted on a pass from fellow senior Dayne Linton for a 1-0 lead in the 10th minute. Linton added an unassisted goal a minute later to make it 2-0, and he scored again on a pass from sophomore Brayden Bergener in the 16th minute. An own goal midway through the first half extended Grantsville’s lead to 4-0, and then it was time for the underclassmen to shine. Sophomore Nathen Wright scored on a feed from Tuckett in the 34th minute, and Tuckett assisted on another goal by Bergener three minutes later. Freshman Quinten White scored the first goal of his high school career just before halftime for the Cowboys. Lowry continued to let the underclassmen play into the second half before changing out virtually his entire lineup about 10 minutes after halftime. 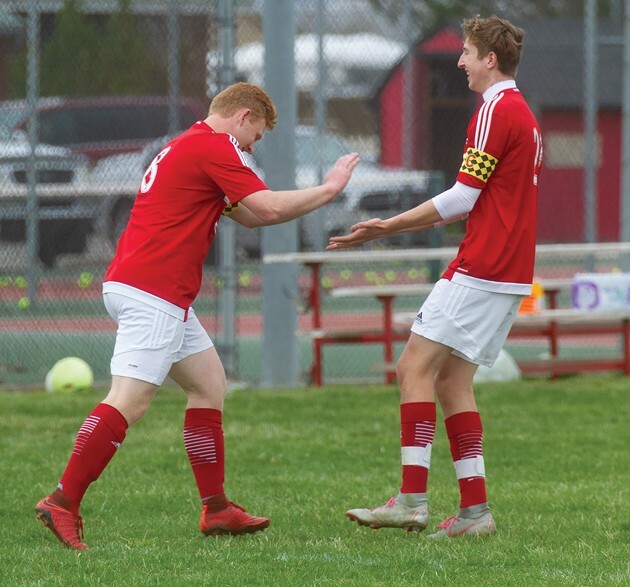 Grantsville wasted little time putting the ball in the back of the net once again as Linton found junior Scott May for the final goal of the contest, as the mercy rule brought the match to a close in the 55th minute. 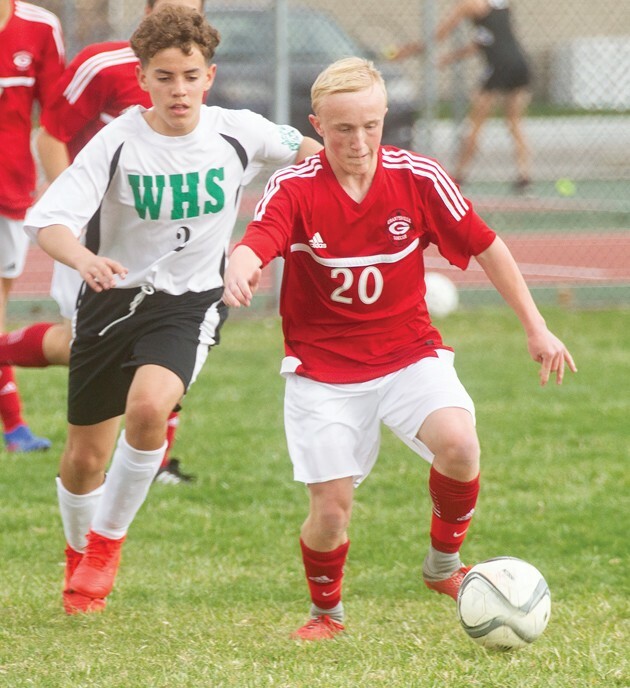 Freshman Zach Carver and senior Randy Harris didn’t have much work in goal for Grantsville, combining for three saves in the shutout victory. Grantsville will resume Region 13 play Wednesday in Bluffdale against Summit Academy. The Cowboys will kick off the second half of the region schedule Friday at home against Judge Memorial.